Today with a pep in my step, I bounced up the stairs carrying the laundry. As I went up, my pants fell down - all the way down - around my ankles. "AAAAAAHHHHH!!!! Yes!!!!! I am getting skinny! I am getting skinny!" I thought. I must clarify that "skinny" to this Armenian girl means a size 10 or 12. Now, is it worth mentioning that I just had the stomach flu for the past 24 hrs? I think not. My pants don't fit & that is reason to celebrate. 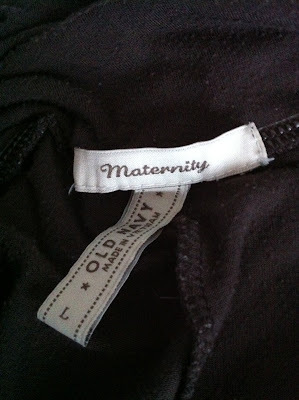 Is it also worth mentioning that my pants had this label? Yeah, probably. No matter. I would still like to thank God and the stomach flu for small victories. Now, if I can just get the stomach flu once a month or so, I might get back into my pre-pregnancy pants. See ya later folks - I'm off to lick carts at Wal-Mart. Have a good Mothers day! Loving your blog! You make me smile! Congratulations! I know exactly how you feel! Last month I gathered up my maternity pants and pulled them all out of my drawers. Whether they fit still or not, I was so done wearing them! I saw you on MeloMamma...very fun post! Hahaha! Too funny! I am right with you girl! Gotta lose the baby weight! Thanks for stopping by the Finding New Friends Weekend Blog hop - I'm following you now. I hope you will join us again next weekend! So great! Too funny - hope you had a great Mother's Day! Lol, if you lick a Walmart cart you may have to go on a diet to gain weight soon! Thanks for visiting my site, your blog rocks!